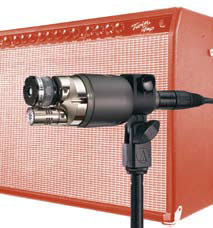 There are almost as many ways to capture guitar amplifier sound with a microphone as there are for a piano. And as with piano (and kick and snare drum, for that matter) single-mic approaches can’t always provide the best solution for guitar amps - we must also explore multiple-mic approaches. with an Audio- Technica AT4050. About four decades ago, at the “dawn” of modern live sound reinforcement, there was the Shure SM58 for vocals and the SM57 for instruments. This eventually included mic’ing guitar amps, because as the PA got bigger than the backline, there was a danger that the guitars wouldn’t be heard over the vocals (causing the sound guy’s credibility to be doubted by the guitar player’s girlfriend behind his back). In the golden days of rock, tuning the PA consisted of saying “check, one-two” into an SM58 and manipulating the faders on a Klark Teknik DN30 graphic EQ until the voice sounded as natural as possible. Because the SM57 and SM58 have nearly identical response, this led to natural sounding instruments as well. Over the years, sound systems have become increasingly full-range and high-fidelity, with modern systems exhibiting smoother, more even response. At the same time, today’s large-diaphragm condensers have become more rugged and sturdy than their tube-based ancestors, and have made their way out of the studio and onto the stage. “Big Mick” Hughes, Metallica’s engineer for a quarter century, is credited with putting Audio-Technica AT4050 studio condensers on stage and introducing their use in stereo pairs on guitar rigs. One popular approach is to deploy a pair of matched studio-quality large diaphragm condensers, each on a separate cabinet of a stereo guitar rig, that also act as a pair of stereo “ears” for in-ear monitors (IEM). They also provide redundancy to the PA, and can be panned or doubled as needed. Most guitar amps don’t achieve their proper “sound” until the onset of clipping, producing that warm, yummy crunch, but yielding high-decibel sound pressure. Strategies include using a “power soak” to draw some of the power off, going with lower-powered guitar amps, or remotely locating the amp or just its cabinet and isolating it from the performance stage. Dynamic mics produce a contoured response, with warmth in the lows due to proximity effect, and often, a highmid presence. Besides the Shure SM57, perennial dynamic mic choices for guitar cabinets include the Electro-Voice RE20, Sennheiser MD421 and MD409 (replaced by the 421 II and e609), AKG D 112, joined by a relatively new contender, the Audix i5. Condenser mics offer extended highs and lows while providing a flatter frequency response. The Neumann U87 is the gold standard for large diaphragm condenser mics, rarely seen outside of studios. It’s heritage also includes the TL103. The AKG C 414, in all its variations, has been crossing over to the stage for many years, popular in particular for drum overhead and grand pianos. 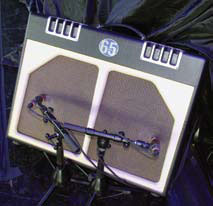 Audio-Technica’s AT4050 is the largeformat condenser that first broke into live sound specifically for guitar cabinets, followed closely by the Shure KSM32. Ribbon mics, with a bi-directional figure-of-eight pattern, have a transparent sound that allows the amplifier’s character to be clearly heard with a natural roll-off in the highs. They re-entered recording studios several years ago when manufacturers began making them more rugged to withstand normal handling. The Royer R-121 was the first modern ribbon to find widespread acceptance, and two years ago the company released a ruggedized “live” version with a thicker ribbon. 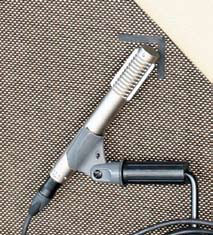 Recently, the new Shure KSM313 ribbon has earned its place on national tours, as has the new A-T AT4081 ribbon mic. Different mic pairings provide a contrast in the sound, useful when the mics are panned in a stereo mix to create dimension and width. They’re also used individually to emphasize different aspects of an instrument, but when combined, can equal more than the sum of the parts. The original studio pairing is to combine a condenser and a dynamic mic. The old studio trick of taping together an SM57 and a pencil condenser, like an AKG C 451, dates back to the 1980s. By picking up the same sound in nearly the same spot, out of phase cancellations at even the highest frequencies can be eliminated. The contrast can provide plenty of control over the texture of the sound without resorting to processing or EQ. Audio-Technica has developed a unique dual-element mic called the AE2500, originally introduced as a kick drum mic, which has also proven useful for guitar mic’ing. It combines a dynamic and condenser element into the same mic, providing phase-coherent summation of both elements when mixed together. in some guitar amp applications. In contrast, another method is to simply take a single mic and doublepatch it to the console, treating it’s EQ differently in each channel and even introducing micro-delay to offset one from the other and intentionally introduce VHF comb-filtering. Whether introduced by mic’ing distance or by processing in a digital console, the effect of a fraction of a millisecond delay for two signals of similar level is narrow cancellations at regular intervals. The physics of comb-filtering is well known. A delay of one-tenth of a millisecond (0.1 ms), which represents a path-length difference of just over an inch, produces its first cancellation null at 5 kHz and a second at 15 kHz. Doubling that to two-tenths of a millisecond lowers the cancellations to 2.5 kHz and 7.5 kHz, leaving 5 kHz and 15 kHz intact - pretty big difference. On many digital consoles, these may be your best two choices, as longer delays will cut into tone below 2,000 Hz when combined. When double mic’ing guitar cabinets, cancellations won’t be heard when the sources are panned hard, each to their own side of a stereo mix, whether in the PA, a recording or in an artist’s in-ear monitors. But when two sources are combined in a mono mix, such as front fills, center cluster, press feed for local TV stations or, most importantly, a guitar player who’s using a mono IEM mix, the cancellations can affect the sound quality of the electric guitar. mounted with a CabGrabber XL. 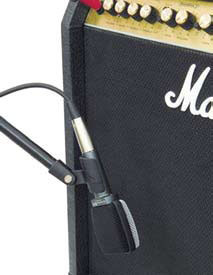 In live sound, the practice of placing mics right against the speaker cabinet’s grill cloth has several purposes. First, it establishes a fixed distance from the cone to the mics, so that when the mic stand gets kicked or the amp bumped, it can easily be correctly reset. This happens all too often on busy stages, so eliminating mic stands drastically reduces the possibility of a mic getting knocked out of place. 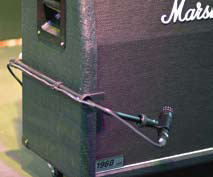 Alternatives include Z-Bars (from Z Right Stuff, originally designed by Shure), an LP Claw, Audix’ new CabGrabbers or simply hanging the mic over the front of the cabinet from its mic cable, either looping it around the guitar amp’s strap handle or just gaffe-taping it to the top edge of the cabinet. Second, the desired mic position can be clearly marked on the cabinet’s grill using gaffe tape to make an “L” or a “U” so that even casual observers can see when the mic is out of position. Third, when all mics are against the grill at “ground zero,” it maximizes their combination without comb-filtering effects. Finally, getting as close as possible reduces the bleed from nearby sound sources, including adjacent guitar amps, keeping the mic in relative isolation. It’s not unusual for the cones in a guitar cab with multiple speakers to have slightly different sonic signatures, especially with vintage equipment. Early in the relationship between a sound engineer and guitarist, it can be helpful to use a mic, a Whirlwind Qbox audio tester, and a pair of headphones to explore the sound of all areas of speaker cones, much like a doctor with a stethoscope. By the way, the act of doing this in front of the guitarist is also a clear demonstration of your interest in his tone. With a little investigation you’ll discover the common wisdom of mic’ing halfway between the cone’s center and its edge. In the center it’s bright, while it’s dull at the edge. The majority of the cone’s surface area produces a balanced sound, while the center and edge balance each other and average out at normal distances. The exception is the cone’s ability to “beam” directly on-axis. In the world of live hard rock or heavy metal, it’s common to find amplifier DIs which take their signal from after the guitar amp and in parallel with a speaker cabinet. The original is the Hughes & Kettner Redbox, and Radial Engineering makes a modern JDX “amplifier DI” that’s active and employs Class A discrete electronics. 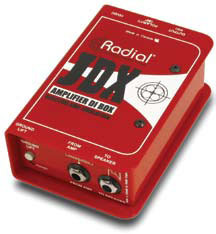 These devices capture the warmth of tube guitar amps, while adding response that emulates a guitar speaker. Redbox DIs eliminate inconsistencies from mic selection and placement, accidental misplacement of the mic and speed up changeovers on multi-band concerts by requiring only a re-patch of an XLR - no mic to move. They employ electronics to emulate the response of a guitar cabinet’s speaker cone, rolling off the highs like a real speaker. They’re specially equipped to take the higher voltage of a guitar amp’s output, but the big warning is they don’t act as a speaker load and must be used with a cabinet, or the amp will fry them. When used in combination with a single microphone, the results can provide a wide range of creative options, and their relative distances are only determined by the one mic’s position. panned away from the rest of the band and the mic towards the band, but it’s a stereo effect and works best with a stereo IEM mix with both ears in. The distance from the speaker cabinet is considered important in most studio recording applications, but in live sound, the inverse square law dictates that placing the mic right against the grill cloth reduces bleed from adjacent sound sources. 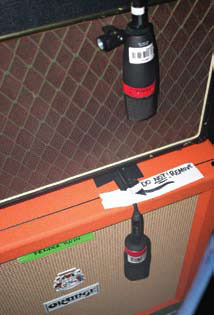 That said, when guitar amps are placed next to each other, use of gobos can increase their isolation from each other. With modern in-ear monitoring, guitar players no longer need their cabinets on-stage with them, so it’s common for the guitar tech to set them up off stage (hopefully on the opposite side of the stage from the monitor console). This gives the guitar tech full access to the amps during the show, and keeps them from muddying up the sound in the venue. Today’s live sound systems provide opportunities to easily make multi-track recordings that allow engineers to compare various approaches to many sound reinforcement applications by swapping different combinations of inputs and auditioning them in the PA, without having to annoy the band to play the song over and over. It also allows the engineer to demonstrate mic choices to a guitar player while he’s standing at the console and listening instead of playing. Do this, and it leads to better communication and collaboration, and you may even become friends for life. For more news and information for the audio professional visit ProSoundWeb.